In this excerpt, Marcy Axness shares the latest attachment neuroscience which indicates that mothers (and other caregivers) literally download a template for brain development to babies through face-to-face engagement. Dr. Axness warns that replacing face time with screen time (or too large a rotation of caregivers) impairs a baby’s psychosocial development. When our first child was born, long before I learned most of what I’m writing about here, I was determined to do everything I could to maximize his development. My devotion to Ian’s betterment had begun during pregnancy, when I listened to my favorite classical music, took lots of walks, thought lots of good thoughts. This was a good start, mainly because these were all activities that inspired me. But once he was here, a certain frenzied insecurity set in, about making sure I was doing enough to stimulate his development. I promptly bought a book on baby exercise — yes, baby exercise! I dutifully followed the prescribed twice-a-day regimen of moving his various tiny limbs around and about, folding and stretching his new little body this way and that. It was supposed to get his sensory-motor development off to a head start, which sounded good to me. As luck and fate would have it, just a couple weeks into our training plan, I attended my first R.I.E. class — Resources for Infant Educarers — and what I heard there that very first day carried the blessed ring of truth. Actually, more like the booming clang of truth. And I got it. However, it isn’t so much their child’s body that parents today are looking to optimize in the early years — it’s their child’s mind. It was about twenty-five years ago when neuroscientists began to realize that the potential of an infant’s brain is not genetically predetermined by a DNA blueprint, but is instead designed to be shaped by the environment, which can either enhance or inhibit its development. The huge spurts in brain growth from the last trimester of pregnancy through the first two years of life invite experience-dependent maturation of the brain: the environment a baby encounters teaches him about the world he has been born into, so his brain can adapt itself to work best in that world. Different environments inspire the development of different kinds of brains. So, what did emerge in the research to be the single effective neurodevelopment optimization system? The technology is quite advanced, so try not to be intimidated by the complicated engineering as you behold this illustration of it. 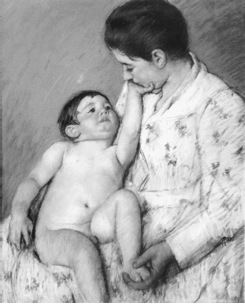 Impressionist Mary Cassatt couldn’t have begun to fathom in 1891 the neuroscientific sophistication of the attachment interactions she cataloged so exquisitely. A mother holds her infant on her lap facing her and smiles at him. He smiles and kicks with delight. She coos, and he squeals. She bends toward him making an outboard motor noise, and he pumps his legs and his arms and squeals more loudly. Then he turns his head away. The mother makes a calm “Ohhhh” sound, and the intensity of their “conversation” begins to de-escalate. When the baby looks back at her, she giggles again, and away they go, mind-to-mind delight rising again. This scene of a mother engaging her infant in a kind of reciprocal series of cooing, giggling, sighing and squealing can be found everywhere around the world, across all divides of race, religion, socioeconomic or technological circumstance. While the researchers use such terms as biological synchronicity(6) and limbic resonance,(7) the sci-fi image of mind-melding isn’t far off the mark. Writes one researcher, in evident awe, “It is a biologically based communication system that involves individual organisms directly with one another: the individuals in spontaneous communication constitute literally a biological unit.”(8) Here we see a major recurrence of the fundamental developmental motif that premiered during early embryonic growth: projection of function outside before internalizing the capacity. During these regulating interactions, the child relies upon the more organized regulatory mechanisms of the parent’s limbic structures to regulate her own internal states and external behavioral responses — i.e., her emotions. Her developmental task over the early months and years is to internalize the capacity to regulate her own inner states. And how is this task jump-started? What that means in plain English is that engaged, attuned, playful interactions with us are a basic and essential form of nourishment for our babies. And further, it is we ourselves that our children are wiring up to be, from the very beginning; this foundation then serves as their launching pad, at the most basic level of brain structure, for surpassing us into higher realms of accomplishment, social intelligence, and joyous self-mastery. The particular area of the brain that depends most fundamentally upon secure, predictable relationship for its most robust development is called the orbitofrontal cortex (OFC for short), which sits just behind the right eye socket in the brain’s right hemisphere and quietly goes about the business of orchestrating the capacities that determine a child’s lifelong prospects for healthy social and emotional functioning. Because of its unique placement and function in the brain, the OFC is fundamental to fostering skills and affinities for peace and sustainability at every level. The OFC is the seat of common-sense thinking; the ability to read other people’s signals and recognize their intentions; to sense their emotions, and have empathy; to make sense of our own autobiographical histories; to imbue intellectual thought with feeling, and vice versa, to moderate emotion with rational thought. “Such neural capacities matter immensely,” writes Daniel Goleman in Social Intelligence, not just for the richness of our interpersonal life but for the wellbeing of our children, for our ability to love well, and for our very health.”(10) The OFC is indeed the brain center for social and emotional intelligence — the skills of how to be a human with other humans. 1. Christakis, Dominic A. “The Effects of Infant Media Usage: What Do We Know and What Should We Learn?” Acta Paediactrica 98 (2009):8-16. The researchers put so fine a point on the infant media debacle as to declare, “Parents hoping to raise baby Einsteins by using infant educational videos are actually creating baby Homer Simpsons.” My contempt knows no bounds for an enterprise that leverages parents’ insecurities and fears (Will my child have what it takes to succeed in this ever more complicated world?) into a frantic market for baby-improvement “infotainment” that flies in the face of everything science knows about what infants and young children need for healthy development. They even thumbed their nose at the American Pediatric Association’s guideline that children under two shouldn’t watch any television. 2. Stern, Daniel N. Diary of a Baby. New York: Basic Books, 1998, pg. 48. 3. Schore, Allan. Affect Regulation and the Origin of the Self : The Neurobiology of Emotional Development. Mahwah, NJ: Lawrence Erlbaum, 1999 (if you’re the intrepid sort and want to read the original work of one of the founding godfathers of the field); Lewis, Thomas et al. A General Theory of Love. New York: Random House, 2000 (if you’d prefer a simpler explanation designed for lay people, and one of the most gorgeously written books ever on any subject, let alone the neurobiology of attachment!). 5. E.g. Amini, Fariborz, et al. “Affect, Attachment, Memory: Contributions toward Psychobiologic Integration.” Psychiatry 59, no. 3 (1996): 213-39. 6. Schore, A. N. “Attachment and the Regulation of the Right Brain.” Attachment and Human Development 2, no. 1 (2000): 23-47. 7. Lewis, Thomas et al. A General Theory of Love. New York: Random House, 2000. 8. Buck, R. “The Neuropsychology of Communication: Spontaneous and Symbolic Aspects.” Journal of Pragmatics 22 (1994): 265-78, quoted in Schore, Allan N. “The Neurobiology of Attachment and Early Personality Organization.” Journal of Prenatal and Perinatal Psychology and Health 16, no. 3 (2002): 249-63; italics added for emphasis. 9. Schore, Allan N. “The Neurobiology of Attachment and Early Personality Organization.” Journal of Prenatal and Perinatal Psychology and Health 16, no. 3 (2002), pg. 258. 10. Goleman, Daniel. Social Intelligence: The New Science of Human Relationships. New York: Bantam/Dell, 2006, pg. 143. 11. Maté, Gabor. Scattered: How Attention Deficit Disorder Originates and What You Can Do About It. New York: Penguin, 1999. 12. Siegel, Daniel J., and Mary Hartzell. Parenting from the Inside Out: How a Deeper Self-Understanding Can Help You Raise Children Who Thrive. New York: Jeremy Tarcher/Putnam, 2003. Her own life and discoveries as an adopted person and a mother led Marcy Axness to pursue a deeper understanding of how we become who we become, how early it begins, and how we can do it in a healthier, more joyful way. She is a popular international speaker on attachment, culture, and child and parent development. Featured in several documentary films, Marcy is an expert in adoption, prenatal development, and Waldorf education. She counsels parents and pre- parents in her private Quantum Parenting practice, applying, honing, and documenting the successful results of Parenting for Peace principles in real life. With her former husband of 25 years, Marcy has raised a son, 24, and a daughter, 21, both of whom are engaging, thoughtful, flourishing young adults. In her pre-motherhood life, Marcy won multiple awards and an Emmy nomination as a documentary writer and producer, covering emerging topics in health for CBS News, and has produced programming for Lifetime, Showtime, and The Disney Channel. She has a solid constituency built up over nearly 20 years of teaching, writing, counseling, and networking within multiple intersecting communities focused on progressive human insights, development, and evolution. Marcy’s combination of life experience, cultural acumen, and scholarly credibility uniquely equip her to chart this compelling, entertaining, and engaging human roadmap through attachment theory, developmental neurobiology, epigenetics, cell biology, prenatal psychology, child development, and consciousness research to illuminate a pathway of healing and wholeness for coming generations. Available from Amazon.com and other book retailers. In the midst of our global human, economic and environmental crises, we have been overlooking a powerful — perhaps the most powerful — means of fostering peace and prosperity: the consciousness with which we bring our children to life and shepherd them into adulthood. If we really want to change the world, we need to raise a generation “built for peace” from its earliest beginnings. Parenting for Peace is a scientific roadmap for how to hardwire kids with the brain circuitry for such essential peacemaker capacities as empathy, trust, self-regulation, and imagination. The win-win is that a child wired in this vibrantly healthy way is a joy to parent, and later he or she will go out into our world equipped to creatively and confidently innovate solutions, and take pleasure in doing so! Marcy Axness’s efforts to educate our world are vital to our evolution! I’m so glad she’s telling the growth-or-protection story because simple fundamentals are where the truth is. I know of no one so well equipped educationally, intellectually, emotionally and intuitively to speak to our times. Dr. Axness has distilled compelling evidence from the fields of attachment parenting, preconception, and consciousness research into a readable, inspiring and hopeful book about what we really want to do as parents: raise peaceful people. Parenting For Peace gives us a roadmap. Marcy Axness’ book has a beautiful message supported by sophisticated understanding of the underlying science. I have borrowed her remarkable translations of findings from our NIH-funded projects in my own lectures. Marcy Axness lays down the simple but profound principles and practices required to raise generations comfortable in their hearts and happy with themselves. A tranquil revolution of the soul and of the home that would benefit all humanity. Passionate and intelligent yet also profoundly simple, Parenting for Peace provides parents with the tools and support they need to create peace and participation in their families, their communities and the world. Highly recommended. I applaud Marcy for calling attention to the importance of protecting the sanctity of the embryonic universe. World peace will only ensue from womb peace. Parenting for Peace is the ultimate thinking person’s guide to nurturing a compassionate child from conception through adolescence. A significant aggregate of knowledge and wisdom woven into a very understandable story. It is well organized and clear, and could be considered “A Manifesto for Humanity,” rather than a parenting book. Dr. Axness brings a clear voice to the number one task for families and societies: to raise citizens committed to cultures of peace through the gift of knowing peace right from the start. And we can do so by “raising ourselves,” in consciousness. Copyright ©2012 by Marcy Axness, Ph.D. All Rights Reserved. Please feel free to duplicate or distribute this file as long as the contents have not been changed and this copyright notice is intact. Thank You! “A Caress,” 1891, by Mary Stevenson Cassatt, 1845-1926, pastel on paper, 29 1/4 x 23 3/4 in., is included with permission from New Britain Museum of American Art and Harriet Russell Stanley Fund, 1948.